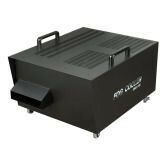 Connect this to our Antari z1500 fog machine to create a low- lying smoke whose effect is virtually indistinguishable from that created by dry ice. The DNG-100 converts normal fog to a low-lying cloud of dense, white fog. Hire charge: £100.00 per week.